The Manouria emys is considered to be the 4th largest tortoise in the world and is sometimes called 6 legged tortoise because of the very large spurs on its hind legs. Manouria phyrei may be twice as large as the Manouria emys. The Manouria emys is the species more commonly kept in the UK and can grow to 50 centimeters and weigh 20 kilograms. Its colour may vary from brown to black. Manouria emys originate in South East Asia from India, Burma, Sumatra, Thailand to Borneo and live mainly in the moist tropical forest regions. The Burmese Brown is a very large non-hibernating species, that requires a large heated area throughout the winter and poor summer months, which is very costly and difficult to achieve for most. This is a tortoise for the serious keeper where ongoing expense is no object. 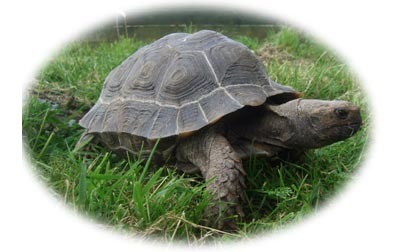 If you are considering buying a tortoise please avoid pet shops, garden centres and tortoise centres and look to purchase your tortoise from a reputable breeder who will provide you with a healthy tortoise and the very best advice for a long good quality life. We have a list of genuine verified breeders on our website.